Would you know what to do when your pet stops breathing? In a life and death situation, time is of the essence! Get hands on experience with our Basic Pet First Aid class. 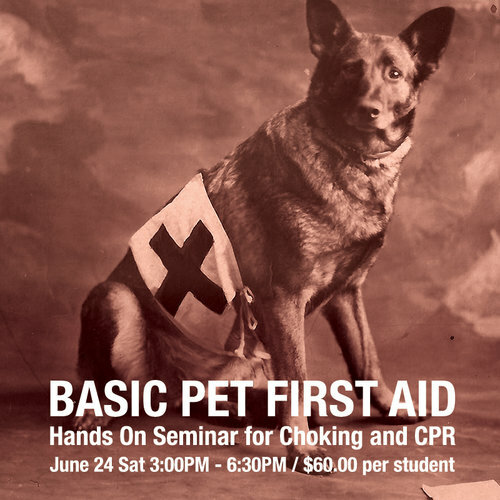 This class focuses on pet choking and CPR. Know what to do when it matters! Students will receive a Certificate of Completion after taking the class. Class is approx 3 - 3 1/2 hrs long with 1-15min break. Cindy Sanchez, an instructor for the American Red Cross since 2001. She is also certified as a Red Cross Pet First Aid Instructor. In addition, she has completed more than 100 hours of training to become a CERT (Community Emergency Response Team) Level 3, requiring successful completion of ER classes for cardiac and respiratory emergencies, trauma and disaster operations, emergency childbirth, oxygen administration, AED, backboard extrication and crisis intervention.